I hadn’t watched this since it kicked my arse back in 2009, and as usual, was a little concerned that it might not stand up to repeat viewing. I’d been somewhat forewarned before that original viewing as to its brutal and unrelenting nature, yet the reality was more gut-wrenching still. Could it possibly have as much impact again? Not having seen the movie in close to nine years probably worked to its benefit. While some elements remained etched in my mind – and likely will be indelible – others had been more or less forgotten, especially in the early stages. I did remember it was the story of two young girls, Lucie (Jampanoï) and Anna (Alaoui), the latter of whom had escaped a life of truly horrific abuse, and been befriended by the former. Fifteen years later, Anna finds the couple responsible, an apparently “innocent” family, and takes her revenge. Except, it turns out, Lucie has to bear the brunt of what follows, for Anna was not the final victim. And nor were the couple the final perpetrators. In case you haven’t seen it, I’ll say no more than that. Just be prepared for something thoroughly unflinching in terms of depicting just how incredibly fucked-up people can be to each other. That’s the astonishing thing, especially about the first half: as it unfolds, things happen which would form the terrible climax of many other horror movies. Yet Martyrs keeps on escalating past those points, until you suddenly realize we’ve gone all the way round, and the cycle is about to begin, all over again. Once more, that would be the point at which many lesser movies would roll the credits. Martyrs is just getting going. And so we get what feels like about ten hours of systematic abuse, without a single word being spoken. It’s only about fifteen minutes. It’s not simply to satisfy some twisted psychopathic need either. It’s for a very specific purpose, summed up in the chilling line, spoken by the woman (Bégin) behind it all: “The world has come to a point that there are only victims left.” The accuracy of that line may be the most disturbing thing about the film as a whole. Which is saying something, considering the number of moments here which got under my skin. It’s not all explicit gore, either. The end has Lucie whispering something to the woman: we never get to find out what, yet the impact of her words will have me wondering what they could have been, for weeks to come. There was a particularly superfluous American remake a couple of years ago, with which I simply haven’t bothered. At best, it could only equal the original. More likely (far more likely, going by the reviews), it would be the gastronomic equivalent of listeria, poisoning my fondness for the real thing. 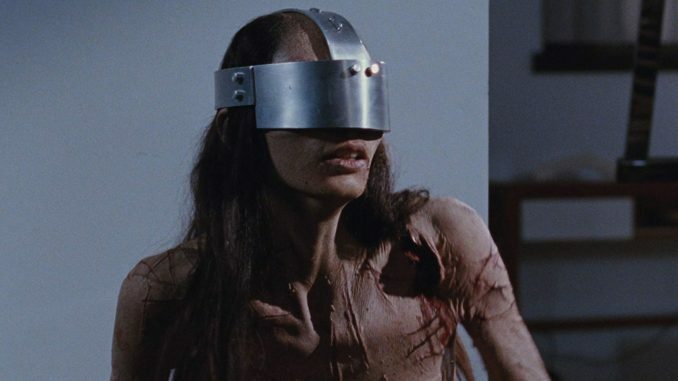 I think I’ll pass: accept absolutely no imitations, for the best the New French Extremity has had to offer.